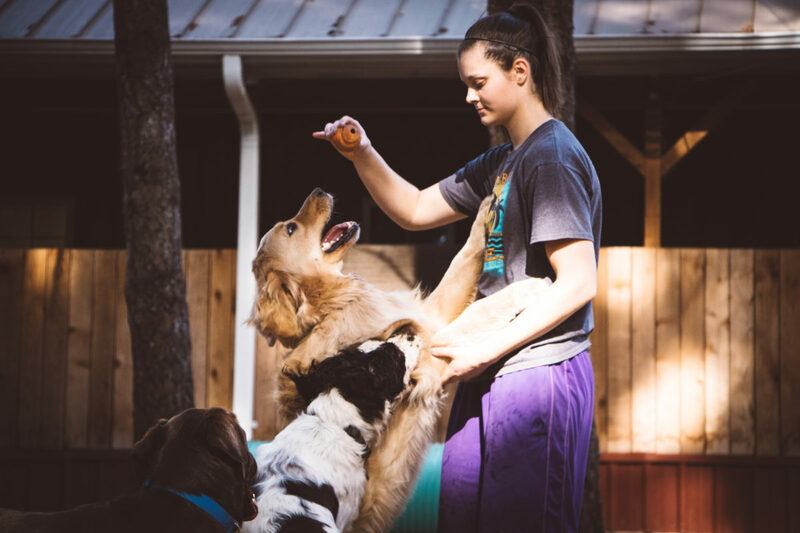 At both Reynolds Dog Resort locations our doggie daycare is a fully-supervised place for dogs to socialize, exercise, and have as much fun as they can! When you pick them up after a long day at work, they are ready to be a calm companion, rather than overly rambunctious. 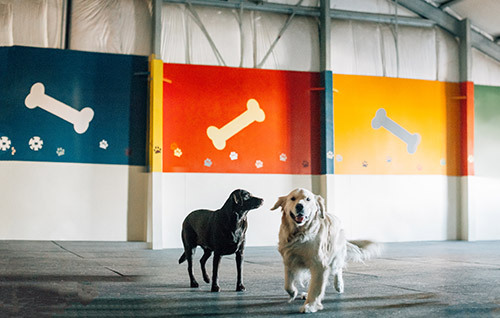 Under the care of our highly-trained staff, dog daycare guests enjoy multiple playgroup sessions throughout the day. Our Tualatin and McMinnville dog daycare programs are operated with the highest standards of safety and, equally important, doggie fun! In the summer, we break out the kiddie pools and sprinklers for a splash of fun in the sun! 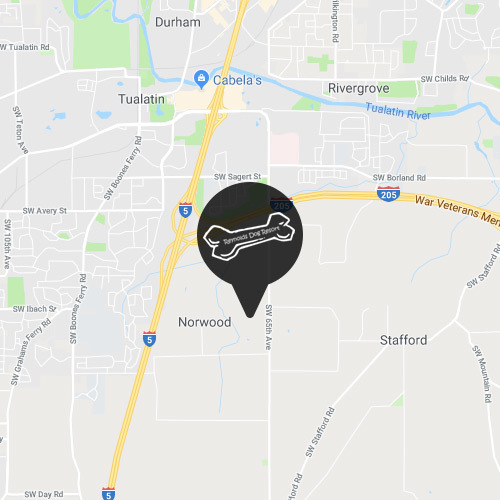 At our Tualatin location, the Reynolds Dog Resort is located right on the Reynolds family farm, with over 6 acres of beautiful countryside. 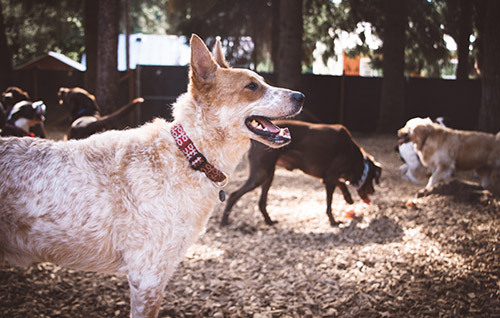 Our yards are fully-fenced and lovingly maintained–it’s like a private dog park for our guests! 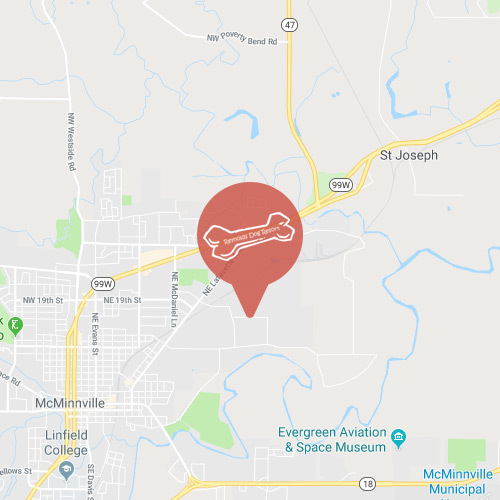 Our love for dogs has spread into McMinnville in the heart of Oregon wine country. Family-owned and operated, this facility is a natural extension of the Reynolds family’s vision. 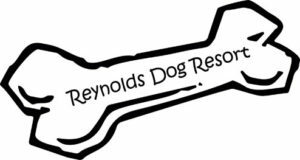 At Reynolds Dog Resort, we prioritize the safety & health of our guests above all else. Here are some of the ways we uphold superior safety standards. We sanitize all areas of our facility every day, using only pet-safe cleaning products. We even have a UV light treatment system for a deep & thorough clean. Our farmland has lots of tree-shade for resting under. Plus, splash pools keep our guests cool on hot days. Doggie daycare is a unique resource that offers immeasurable benefits to dogs and their pet parents. It’s a fully-supervised place that engages a dog both mentally & physically while strengthening his social skills. Veterinarians and pet care professionals agree that daycare is the best way for your furry friend to stay stimulated & exercised while you’re away. Stimulation for the Mind & Body. Dogs need exercise and entertainment to stay at their happiest & healthiest. Doggie daycare provides constructive stimulation in a secure environment to ensure you have a sleepy, happy pup at the end of your own busy day. It Prevents Boredom. Dogs can grow bored when left alone for long periods of time. A bored canine can find lots of things in a house to keep him occupied, like chewing on furniture, shoes and barking excessively. Daycare is a super fun and safe solution to this common canine challenge. Dogs Need Socialization. Because of their social nature, dogs benefit greatly from socialization. Studies show properly socialized dogs are more confident and overall better-behaved. Doggie daycare is the ideal environment for dogs to play with other dogs (and humans!) under the supervision of highly-trained staff.